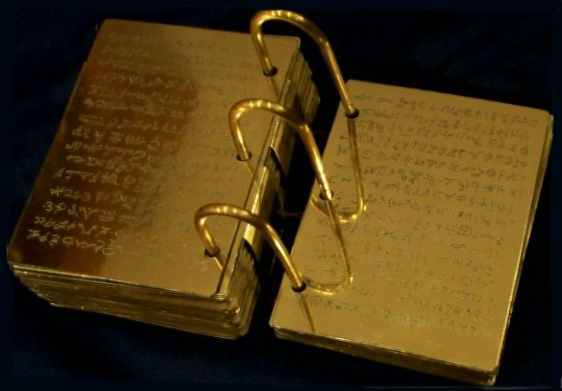 Joseph Smith, the first Mormon Prophet, claimed he was divinely guided to a set of gold plates that were buried near his home in the state of New York. After taking possession of these plates, according to the official LDS account, Joseph translated the ancient writing they contained, which resulted in the Book of Mormon. Using eyewitness accounts in the video below, researcher Dan Vogel takes a look at the story of Joseph Smith bringing the gold plates home from where they were buried in the Hill Cumorah. Mr. Vogel’s telling of the story begins with Joseph’s employment as a money-digger in 1826, and continues through December of 1827 when Joseph and his wife Emma fled town with the gold plates secreted in a barrel of beans. In examining these few months of Mormon Church history, Mr. Vogel notes discrepancies and suggests some alternate explanations for certain claims made in the Mormon Church’s official narrative. As I watched this 46-minute video, I couldn’t help but think that a Mormon’s reaction to the information might be, “Those darn plates!” If Joseph Smith had merely claimed a vision or revelation, the story would be much less problematic for Mormons to maintain (of course, the Book of Mormon itself would still be fraught with problems). But because Joseph Smith brought tangible evidence into the mix in the form of the alleged gold plates, as well as his detailed efforts to gain and keep possession of them, many objective facts exist by which to measure the veracity of his story. From the weight and material of the plates, to the “spectacles” found with the plates, to Joseph’s injury fighting off attackers, to the efforts of evil men trying to steal Joseph’s treasure, Mr. Vogel presents various historical voices that fill out and go beyond the carefully crafted official Mormon narrative. These eyewitness accounts serve to contextualize and expand the viewer’s understanding of events comprising the birth of Mormonism, but they also tend to elicit troublesome questions for thinkers. Those darn plates! This entry was posted in Book of Mormon, Early Mormonism, Joseph Smith, Mormon History and tagged Book of Mormon, Church of Jesus Christ of Latter-day Saints, Gold plates, Joseph Smith, Mormonism. Bookmark the permalink. There are many problems with the Book of Mormon that point to it being a man made item , and this video brings attention to some of them . But concerning my own examination of Mormonism years ago the Book of Mormon was only a part of that examination . I had ordered a wide selection of publications by the Mormon church containing teaching from early Mormon prophets to current ones . By starting with an examining the content of those sermons I learned that Mormonism was a man made religion — Mormon leaders were indeed some of those type prophets who Jesus warned would come in the latter days ( Matt 24:11 ) . As a Christian I had learned to test any prophets / religious messengers nowadays from the apostle John’s counsel in 1 Jn 4:1 , and it served me well in examining the claims of Jw’s , and so I applied it to evaluate Mormon prophets as well . the Mormon church today . I ‘ve simply look ed at the BM and asked myself if I really need it . The answer keeps coming up a “no” . The Bible is God’s word and contains the kind of information that if embraced then my neighborhood , my home , my personal life will all be in good shape . A lot of detail in the video. It gives a good picture of the mind-set in the population surrounding Joseph Smith at that time. I would just ask the average chapel Mormon if the BoM is an actual history and if so where is the proof that it is authentic. I don’t want to hear about conviction, personal revelation and “knowing” through the spirit. If the book is factually true, then it shouldn’t be that difficult to prove it. Another thing. Has the BoM been changed since the original “revealed” edition? Yes it has and the interesting part is that the changes effect Mormon doctrine. Some people are drawn to the story and like it along with all of the rituals, rites and culture of Mormonism. Having bought into the sect emotionally, any rationale will do to keep the dream alive. information in the Bible is efficient to lead a person to be reconciled to God ,receive forgiveness of sins and receive complete salvation , and also to be our manual of how to live a righteous lifestyle. The funny thing is that often times the last thing to go for LDS folks is the BoM. Sandra Tanner talks about how her and Gerald had pretty much crossed everything related to Mormonism off their list. The last thing was the BoM as I remember it. I’ve heard Mormons who have basically left the LDS church and when they go into a Christian church the first time they’re carrying their BoM. It’s said that’s why it’s very important for Christians to exercise patience when dealing with those exiting the LDS church. I remember a rather aggressive TBM who use to show-up here. He had the opinion that people leave the LDS church because they stopped reading the BoM. Well that’s the other end of the continuum if you can believe his opinion. Bottom-line, for faithful LDS folks, it’s often a long arduous process leaving Mormonism. The basis of believing in and accepting the BoM is a “promise” made by one of the characters in the book that the reader will receive a “burning in the bosom”. To a faithful Mormon, it doesn’t matter if there is a mountain of evidence that the book is not historical document. They felt something as the result of the meaning and therefore it’s true. Mormons will point to the apostle Peter who confesses that Jesus is the Messiah and Jesus tells him that God the Father has “revealed” that to Peter. I know it’s more than a tremendous leap to now interpret that event as being prescriptive as to a feeling a person might get about just about anything. It’s instructive that a Mormon will accept just about any explanation regarding the flaws in the BoM to maintain their belief in it. I had a young Mormon man tell me that the DNA evidence proves the BoM. I sent him an article that had nothing to do with Mormonism, discussing the origin of the American Indians based on DNA evidence. He would not have found the article to be faith enhancing. So what about the feeling that someone might get while reading the BoM? The book is advertised as another gospel of Jesus Christ. It also borrows heavily from the Bible particularly the prophet Isaiah. So what could a person be reacting to emotionally? It’s not hard to figure out. To get a feeling, conclude that it’s from God and that it proves truth is more than a little risky. I know. The person prayed about it and the feeling was an answer to prayer. I would ask if it’s possible for a person to pray about something, conclude an answer had been given and then find out their conclusion was wrong? Excellent point. If the Bible contains the fullness of the gospel, then the Book of Mormon — regardless of its virtues — is unnecessary. I know of many Mormons who have had that “burning in the bosom” while reading the Book of Mormon or while participating in other spiritual LDS activities. I’ve had it, too, once while reading the Book of Mormon. Being an analytical type, when this occurred (several times) I immediately interpreted the warm, good feeling as a message from God, however I also asked myself just what that message might be. I immediately turned to prayer and asked God if the message was that Mormonism is true, or if the message was that a particular part of Mormonism was true. (Mormons are taught that when they receive this spiritual burning that puts them in a peaceful, benevolent and receiving frame of mind, this is an excellent time to ask God what he wants of us and what that spirit means.) Actually, that’s very good advice for all of us. In my case, the message did not come back that Mormonism was true, nor that a particular aspect of it was true. The message that was impressed on my mind was that at that moment I was doing what God wanted me to do. Now, that can be interpreted several different ways. I interpreted it to mean that God wanted me to be feeling kind thoughts and inquiring about Him. I thought it curious that I did not get a warm message specifically confirming the truth of the Mormon Church. I did, however, feel generally good about the Church and I stayed active for several years, all the while noting a number of serious flaws in the organization and its teachings. Ironically, it was that burning in the bosom that allowed me to later evaluate Mormonism more objectively and wish it would reform, be honest, and conform to Christ’s teachings. I would respectfully suggest that Mormons (and everyone else for that matter) consider that the burning in the bosom many of us feel from time to time is a good thing. Think of it as that good feeling we get when reading a story, hearing poetry or watching a movie that touches our soul. (Guys, I know this is a difficult concept for us. It may help to remember how you felt when watching the end of “Shane” or “Carousel,” even as you knew they were fiction.) Along those lines, that warm feeling does not mean that “Shane” is a true story or that the poem was factual: It means (hopefully) that the Spirit is trying to tell you that you have the light of Christ within you and that it is inspiring you to be a good person and make good decisions. And to LDS and former LDS who are struggling with those initial spiritual experiences: Please consider that it might very well have been God telling you that you are loved, that God is pleased that you have opened your heart to Him, and that He wants you to openly and objectively analyze all the facts around you and come to Him. If the LDS Church played a role in getting you to that point, you have every right to feel grateful to the Church. But just like when you read that poem or story that touched your heart, foster and nurture that feeling of peace and love, and move on to study Jesus and what God really wants of you. You can know the truth. John 8: 32. One of my favorite topics is spiritual phenomenon and how people use, mis-use, are led off into the abyss and are entertained by it. That’s the thing I don’t think the LDS folks get. Pick up a copy of “Temple Manifestations” written by a Mormon. He chronicles the Mormon experiences in the spirit realm going way back. It’s enough to make your hair stand on end. I believe it was Willford Woodruff who claimed the signers of the Declaration of Independence appeared to him demanding that the temple work be done for them. He called them “choice spirits”. Then there are the day-trippers through the temple doing their baptisms for the dead that claim the “veil is lowered” and they have spirits appear to them. There are LDS who would love to have spirits of the dead appear to them and in their minds confirm the wonderment of the rituals. They have no clue that they are up to their eyeballs in occult practices. They aren’t even shocked to find out that there are occult symbols on their temples. There’s always an excuse. In the video, we learn that Joseph Smith and his relatives and acquaintances were gallivanting all over the country side at night with Smith leading them with his magic rock in an effort to find buried treasure. The story of Smith’s quest for the golden plates is occult practice 101 and it all had a heavy buy in from these folks. Grant Palmer talks about how, by the time Smith and his church arrived in Ohio, he had to dial it back because the folks there weren’t into the folk magic practices of the Smith clan. To some degree, Joseph gave up his magic rock and just started to have “revelation” without it. But magic rocks were pretty common among the pack Smith ran with in New York. But it can be an honest mistake to not realize the distinction between truths contained IN the Book of Mormon , and the Divine authenticity OF the Book of Mormon . The Koran also contains some beautiful truths about Jesus . However, Islam is not endorsed by God . The Bible is God’s Word , He has preserved the true gospel down through the centuries so that people who heard it preached or read it , could come to know who Jesus is and be saved — Jn 20:28-31 ; 2Pt 3:9 , and that same gospel of salvation still saves today — Rom 1:16 . No need for Mormonism at all .